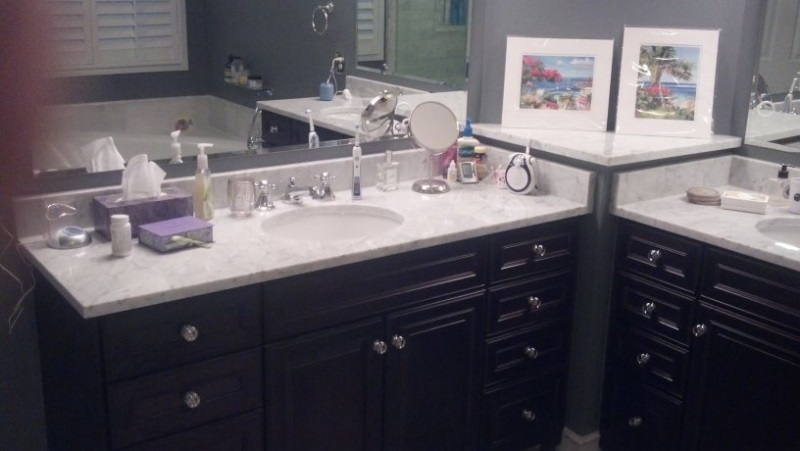 Bathroom remodeling projects are often some of the most challenging. Special consideration must be taken to ensure proper supports are in place for large tubs, and everything must fit together just right for the finished product to be perfect. The professional contractors here at Cricket Creek understand this concept, and will work diligently to ensure that you get the beautiful bath you want. Each individual homeowner is unique. The needs of the previous owner were very different from your needs. Our goal is to create the beautiful bath you have in mind within the budget you set. Tell us your ideas. We’ll help design your beautiful bathroom based on your ideas, not ours. We will present options and help spark ideas during the design process. Choose the materials and hardware. We’ll help pick out materials and hardware that work well together to provide the look you desire. We’ll help get the best price possible. Deconstruction begins. We’ll schedule a date to begin the deconstruction of your existing bathroom. We will be very mindful of the disruption and mess, cleaning as often as needed to protect your home. Bathroom remodeling begins. You will, of course, be able to watch the process if you wish. It’s very interesting to watch as your old bathroom becomes a new, beautiful bathroom. The project is finished. Your old bathroom has been transformed into a work of beauty.